Yesterday was a great day for the newspaper industry. 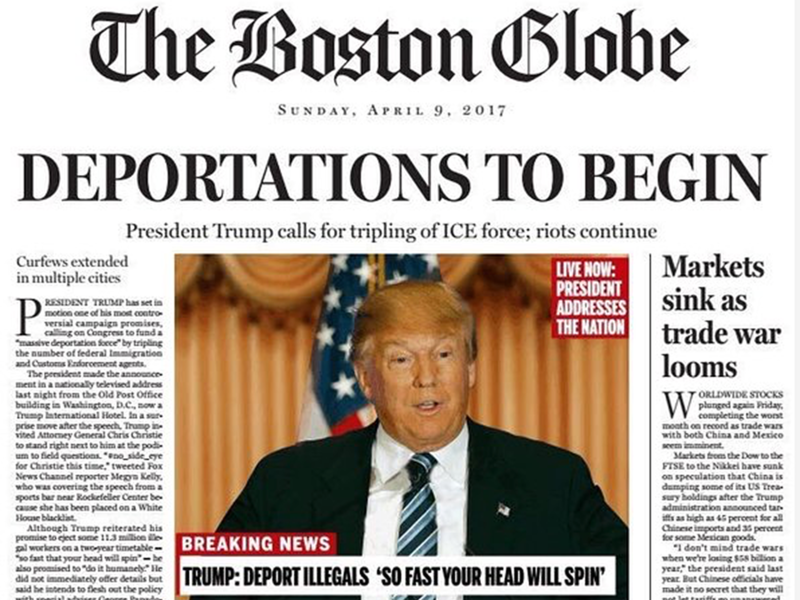 For once, the industry was in the headlines in a good way — for a satirical front page The Boston Globe published presaging what a Donald Trump presidency might look like. Harrumph, harrumph…In other words, doesn’t The Boston Globe have anything more constructive for its staff to do than come up with a farcical front page tweaking Trump? The answer, unequivocally, is this project says more about the petrifying prospect of a Trump presidency than any amount of “straight” reporting or editorial commentary could do. …For the record, this wasn’t the actual front page of Sunday’s Boston Globe; it was the front page of the paper’s Ideas, or opinion, section. This is Donald’s Trump’s America. What you read on this page is what might happen if the GOP front-runner can put his ideas into practice, his words into action. Many Americans might find this vision appealing, but the Globe’s editorial board finds it deeply troubling. Trump, of course, does not have sufficient sophistication to appreciate satire; he’s a hammer-and-anvil sort who blows and blusters his way forward, lurching from one crazy statement to another, only to retract half of them. On the subject of editorial pages, the McClatchy website is advertising job openings for two posts on The Kansas City Star editorial page. One posting is for an editorial page editor; the other for a columnist. The new hires would replace Steve Paul and Barbara Shelly, who took buyouts recently. Paul was editorial page editor; Shelly a columnist and editorial writer. I’m sure the two remaining editorial writers, Yael Abouhalkah and Lewis Diuguid, were thrilled to hear that McClatchy intends to hire replacements for their departed colleagues. It’s good news for readers, too, of course; an editorial page produced by two people, even including someone as prolific as Abouhalkah, would have been a significant disservice to KC Star readers. Better still: Use the two new hires to replace Yael and Duiguid. I nominate Jim “Eyeshade” Fitzpatrick to carry the people’s water. I’ll carry it to the first tee, then somebody else will have to do the hauling. You’re wrong, sadly Trump doesn’t retract half of what he says. Fotunately, he doesn’t believe most of what he says either. Were his deportation plans implemented the very industries he’s invoved in, hospitality and construction would be in dire straits and he knows it. But then again, his immigration statements, like everything he says, are either unconstitutional, legislatively impossible, or outright lies. As for his enhanced libel laws, were they in place now most of Trump’s supporters would be in court as I type. The only question now is when will The Globe give smilar treatment to the felonious hag and looney totalitarian running on the other ticket. As for the editorial slots, once again McClatchy is showing the business acumen that has reduced it to a penny stock on the Exchange. Here, Tracy is half right, fire Yael and Lewis but, replace them with no one. The editorial page has been a counterproductive and predictable joke since Rich Hood left.